Tell us a little about what the Receptionist/Office Support individual does at Traverse City Tourism. As Receptionist/Office Support, I am the first point of contact a visitor will encounter at Traverse City Tourism, by phone or face-to-face. As Receptionist, I answer questions, offer suggestions, guide callers through our website, and redirect calls as requested. As an Office Support individual, I assist staff with various projects, which sometimes includes editing documents and publications, contacting members for information, or pulling together mailing packets. I also help manage our regular mailings to potential visitors inquiring about Traverse City. What did you do before Coming to Traverse City Tourism? Before working at Traverse City Tourism, I worked part-time as a sales associate at Cherry Republic in downtown Traverse City and part-time as a Learning Lab Aide at Michigan Works in Traverse City. Before that, I worked various front desk receptionist jobs as a college student at CMU and NMC. 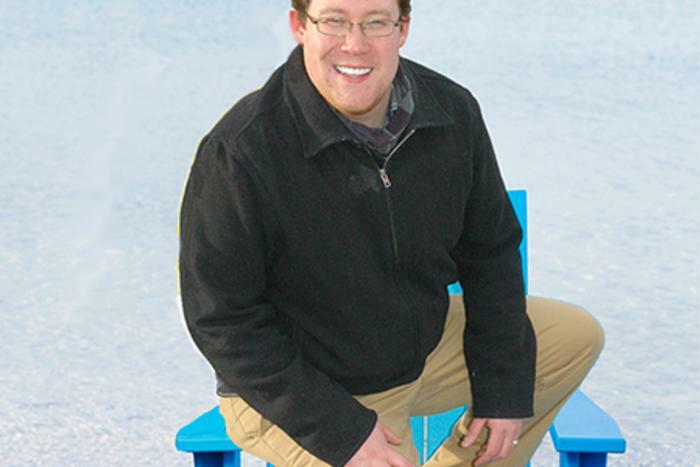 I have worked for Traverse City Tourism for a little more than one year. I love the team I work with at Traverse City Tourism! Aside from being a great group of people, we all have great camaraderie. Every day I get to share at least one laugh with my coworkers. I also really enjoy talking to visitors about this beautiful city that I get to call my home. 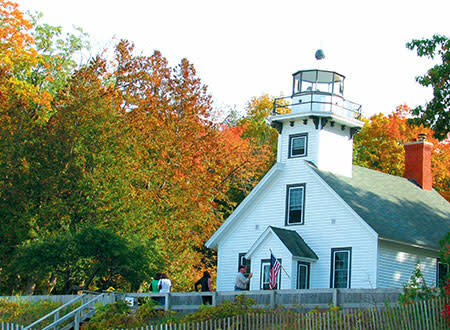 Some of my favorite attractions and destinations include the Pierce Stocking Drive at Sleeping Bear Dunes, the Mission Point Lighthouse, TASTES of Black Star Farms (my sister works there! ), Leelanau Cellars, and Downtown Traverse City. There are so many restaurants to choose from in Traverse City, but some of my favorites include Bubba&apos;s, North Peak Brewing Company, Georgina’s, Grand Traverse Pie Company, and Chef’s In. My favorite downtown lunch spot is Chef’s In. The food is always excellent and the staff there are so friendly. My favorite sandwich is the Sandpiper with added salami. It’s grilled up between two delicious buns. Chef’s In also has great soups and a salad bar. I enjoy people-watching and the view of West Front Street from a stool by the window. 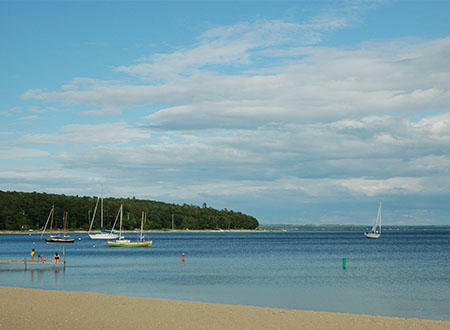 Traverse City is a picturesque, four-season, destination city. The scenery here is spectacular all year-round! From beaches and water activities, to downtown shopping, to award-winning restaurants, there is always something great to do and see in Traverse City! The perfect day would start with breakfast at the Omelette Shoppe or The Remedy with my wife, followed by a stroll through downtown Traverse City or sitting by the sparkling blue waters of West Grand Traverse Bay. For lunch, we’d head to Chef’s In for a sandwich to go, then take a drive north through the Leelanau Peninsula, making a few stops at our favorite wineries and cideries. We’d find a place to swim in the afternoon, then head back to downtown Traverse City for dinner at Bubba’s. We’d top off this perfect day with a trip to Moomer’s to eat some of America’s best ice cream. If you could wish for a celebrity sighting on the streets of downtown Traverse City, whom would you want to see? I would love to run into Jennifer Lawrence, Sandra Bullock, Josh Groban, or Sara Bareilles. I have never experienced a celebrity sighting in Traverse City, so seeing anyone famous walking around the area would be awesome! Fall is my favorite season in northern Michigan. Fall color is spectacular here, with vibrant reds, oranges, yellows, and hints of green speckled through the trees. The air is crisp, the water is blue, and there’s something about the golden sunsets that makes me feel really good about life. Picking just one memorable Traverse City moment to describe is difficult, but I’d have to say my wedding is my favorite one so far. My wife and I got married in October of 2014. All of our family and friends came to celebrate with us. The autumn foliage was at peak color. It was 60 degrees and sunny on the only cloudless day out of the entire week. We got married at Central United Methodist Church downtown and took photos by the Boardman River. We enjoyed a picture-perfect drive north to Leland and took photos with our wedding party in and around Fishtown before our reception at the Leland Lodge. I couldn’t have asked for a more memorable day!